Conveniently located; 1 min walk to bus stop and 3 minutes walk to Coles, shops and restaurants. 5 minutes’ drive to Ringwood stations, Maroondah Hospital, Eastland, Costco, Aquatic Centre and Gyms. Mullum Mullum walking tracks is just a stone throw away. This cosy 3 bedrooms house is situated in a safe, quiet and lovely street with friendly neighbours. The house is bright, clean with spacious lounge area, separate kitchen and a large sunny courtyard/backyard. Details: FURNISHED BEDROOM The spare bedroom has a hallway and main door for privacy. Separate from the lounge, master bed room and front entrance. 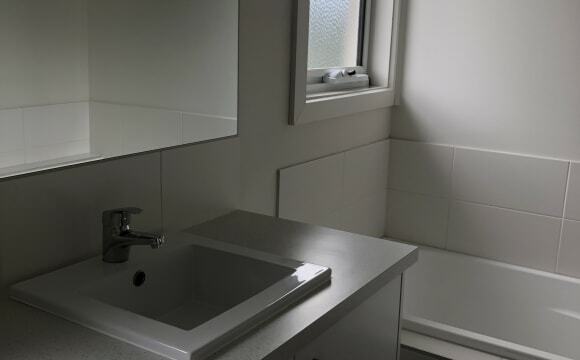 Large, modern and clean bathroom/toilet you will share with another housemate. Separate bath and shower with plenty of storage space. • Gas ducted heating, air conditioning, dishwasher, share and use of all facilities; kitchen utensils/crockery, fridge, laundry/washing machine and TV. •Bedroom (facing backyard away from street) - built-in wardrobe, top quality bed, study desk and large enough for a king size bed. Rent options: - $155pw /$715 pm (INTERNET included) but split utilities bill equally amongst 3 people. 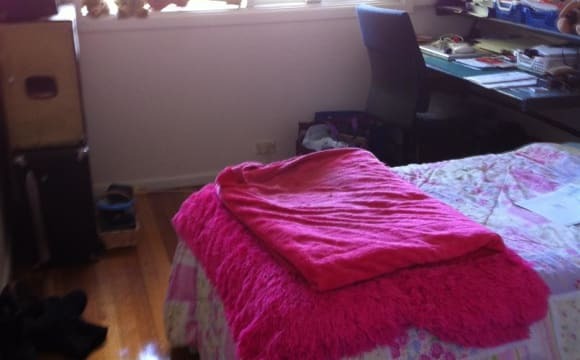 Or - $190pw/$823.40pm (INTERNET and all utilities: gas/electricity/water bills included). Available to move in as from 17/6/2019. This house is located on a quiet street, 12 mins. walking distant to Ringwood railway station, Bus Interchange, Eastland Shopping mall, where Coles, Kmart, Food court, Costco, lots of cafes inside the mall. Salvation Army Corp., Church, Tennis Club nearby. Everything is at an accessible distant. This beautiful 3 bedroom unit is located in the heart of Ringwood - only a short walk to Ringwood railway station and main bus station. A 25 min train ride will take you directly to melbourne CBD. Newly furnished! Right next to Ringwood station is the newly renovated Eastland shopping centre, which features shops, movie theatre and restaurants . Lake park, Mullum Mullum Creek walking , EastRingwoodReserve ,Mullen reserve.Aquanation centre and golf course are all just at your door step. :) 1 * private room with new furniture + Own bath (separate bath+ shower) have become available for rent. Looking for a housemate - couples considered. You are welcome to use all kitchenware and appliances as long as you clean them properly after use! Available from 01/05/2019 inspections available after 23/04/2019 inquiries welcome. Share bill. $30/month/person unlimited wireless internet if single and $20/month/person if you are a couple. Rent is to be paid monthly ($1130pcm/room For single female or $1250pcm/room or a couple ) one month bond is required upfront. Looking for clean, considerate professionals - students considerred. No smoking . No pets. Inspections can be arranged with at least 1 day notice. Feel free to ask any question! Thanks ! Room available in fully furnished house with lots of character. Built in robes, own bathroom (semi ensuite) and bed if required. Space for separate living area if desired. Close to station. Share with 32yo female and small well behaved dog. The house is in a new condition, double store. And very clean. Fantastic location in a prime growing suburb Ringwood. 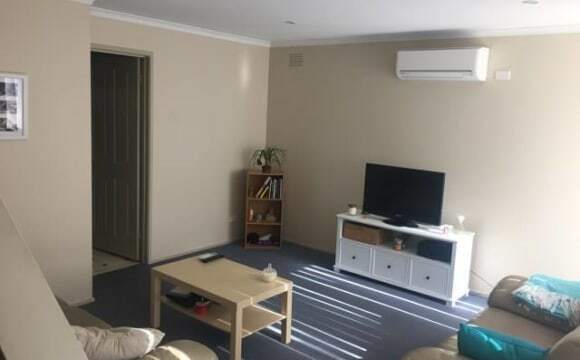 It takes a 3 minutes to walk to Costco Ringwood, 5 mins to Eastlands Shopping Centre and 10 minutes to Ringwood train station with other amenities nearby (McDonalds, Coles, ALDI, Bunnings = 5 mins walk) House is well kept and fully furnished. 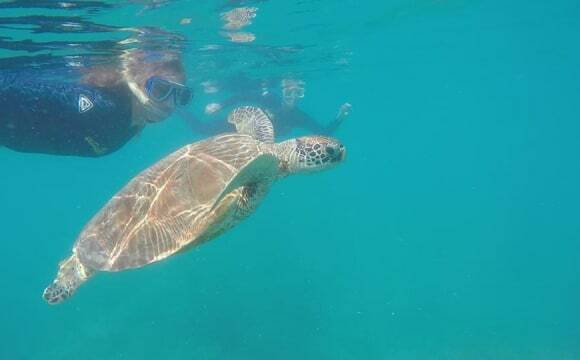 Looking for the right person to share this amazing place with us. Room 3 is the one being advertised and is fully furnished with large L shaped table and single bed and mattress (different to pictured bedroom furniture as that was taken by an agent). Room includes build in wardrobe. House has 3 toilets, so you get one all to your self but the bathroom is to share. Kitchen fully equipped with all necessary appliances (rice cooker, blender, oven toaster, large fridge, microwave etc) and washing machine. Contact me if you have further questions. 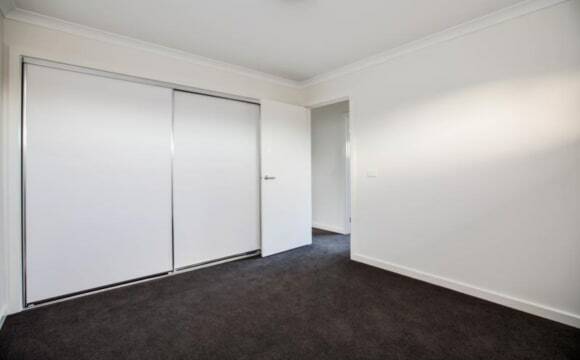 The apartment is a 3 minute walk to Eastland, a 5-7 minute walk to Costco, Ringwood Square Shopping Centre, and a 7-10 minute walk to the Ringwood station. This is a farily quiet building and a quiet neighbourhood. 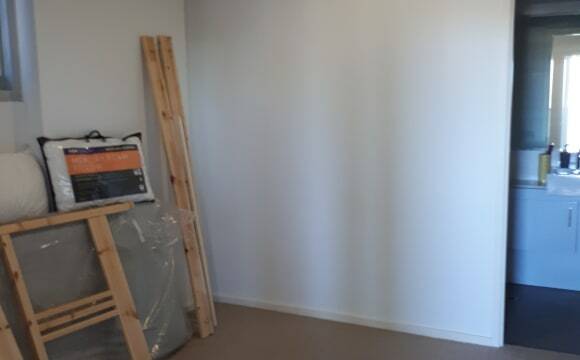 The unit is fully furnished and there really isn't any spare room for extra furniture (nor is there a really a need for anymore), but the room for rent will be empty. Contact me to arrange a time to come around to view the place, and we can discuss any other questions you may have then. Master Bedroom for Rent Large bedroom (queen bed size). With or without a bed (queen size bed available). Features and facilities Own bathroom, Built-in wardrobe, Air-conditioner, Double glazed windows, TV aerial outlet Rent and bond Single person $265 per week, including utility and other bills Bond 2 weeks rent Availability period Available for 6 Months to indefinite. Other information Room available with own en-suite. 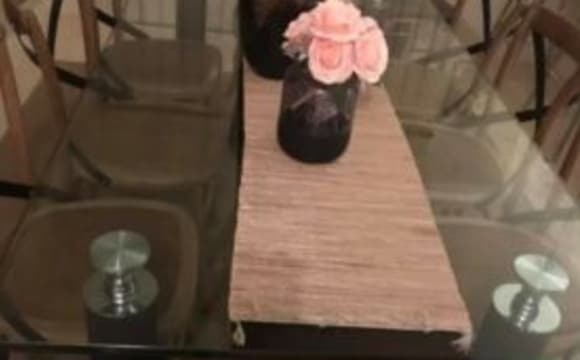 Please ignore the furniture that appears in the photos as they will be removed. Fully furnished, home, located in Ringwood. Includes: air-conditioning/heating, broadband internet, dishwasher, clothes washer/dryer and BBQ facilities. 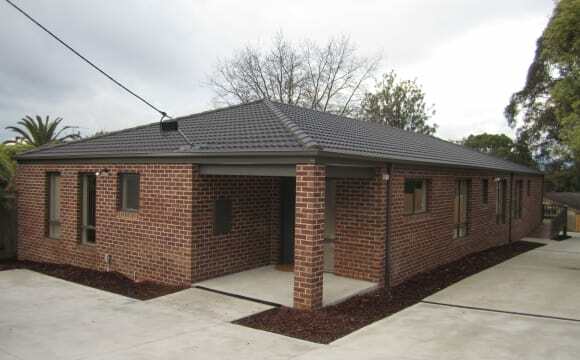 5 minute walk to Ringwood Station and Eastland shopping centre. 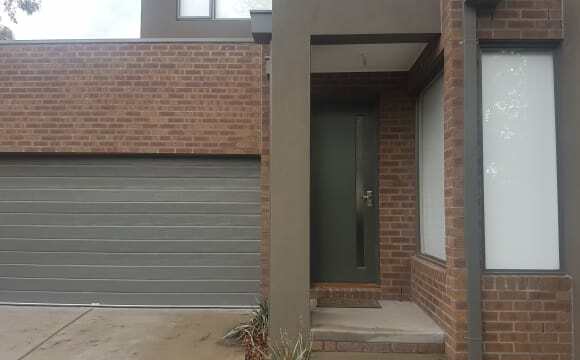 Close to Shopping centre, railways stations and hospitals (Maroondah and Ringwood Private) ringwood lake and walking/riding tracks, fast food, cinemas, restaurants, service stations. Private and treed, older style home but comfy, feel free to put your feet up. No air con but fans provided. (stays pretty cool enough inside). Treed Aussie garden tucked away and surrounded by all our beautiful parklands. Feels like country living. We are looking for someone to take the spare room in our lovely two bedroom townhouse, bills are included in the weekly rent. Fantastic location between Ringwood North shops and Eastland, with a bus stop at the front and a 20 minute walk to Eastland/Ringwood train station. The living area and kitchen are downstairs with your own private toilet. Upstairs 2 bedrooms (1 is yours, with a view of the pine trees at the park next door) good sized room with great cupboard space and split system AC/heater also upstairs the bathroom with a shower and bath. The house: - Beautiful clean and simple house with floorboards throughout - Newly painted - Big backyard with garden in the front and back - Ducted heating - Unlimited NBN internet - Good sized rooms - TV with Netflix and Stan and all those things - Gas oven and stove - Washing machine and washing line - The comfiest couch ever - Room 1 has a built-in robe The location: - Super convenient spot on a quiet and leafy street - 10 min walk to Ringwood East Station (I walk all the time) - Less than 5 min to Eastland and Eastlink - Back from Mt Dandy highway across from Maroondah Hospital I absolutely love this house, it's just a simple and cosy spot but so easy to look after and live in. I still need some furniture, including a dining table so if you have things, you are more than welcome to bring them with you. --- more photos coming --- You will each be paying $650 a month on a monthly basis. It has easy access to everything the eastern suburbs have to offer and the backyard is a 16 space carpark which means your vechile is secure and off the street. The house itself is amazing and personally I feel that I could not ask for more in house. It is spacious and quiet and also has heating and air conditioning. The house is great. Very homely. It's located 8 minutes by foot from Mitcham station, and even closer to a shopping village. The ceilings are super high so it doesn't get hot in summer. The loungeroom has a couch in it but that's it, so you can put whatever you like in there. The couch doesn't even have to stay. The available room is a decent size, would easily fit a double bed. 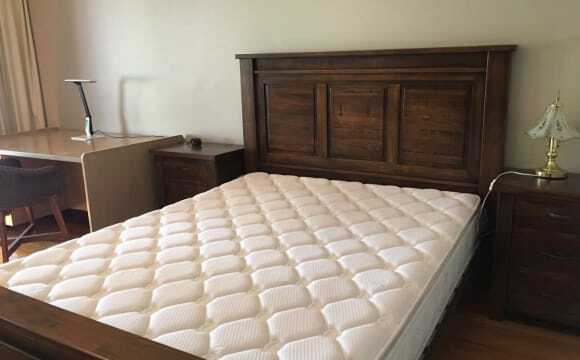 You'd get a queen bed in there too but it might feel a little cramped depending on how much furniture you have. There's also a huge room directly opposite that I've just been keeping a bookshelf and a desk in. It could be used as a bedroom but it doesn't have a door so you'd probably want to put up like some sort of sheet for privacy. Easy street parking .Good size flat. 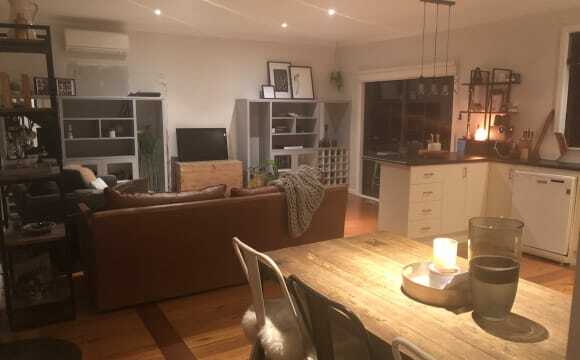 Close to Mitcham train station, coles, cafes and Gyms. 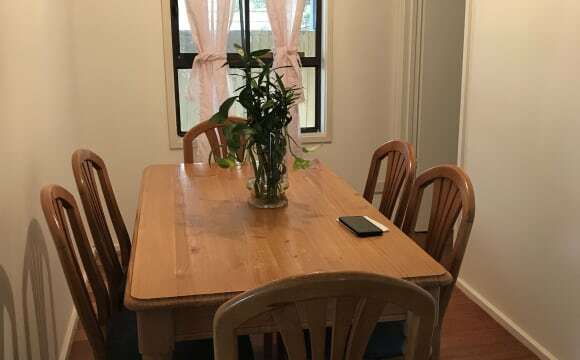 Private SINGLES furnished Room, DOUBLES Bed, Wardrobe, 43" TV with Chromecast, study table, standalone heater, house has ducted heating, FREE Telstra Cable, Super-Fast Mesh Wi-Fi AVAILABLE 24 May 2019 $220 PW, excludes bills ($40PW) 5-10 minutes' walk from Mitcham Central Train Station, bustling hub of stores, food and amenities - 2 common toilets/bathrooms - Great dining/communal area, fabulous kitchen with stove, oven and fridge - Strict and clear house rules/expectations to ensure peaceful and harmonious living (non-smokers) - Licensed &amp; Professionally Managed: A mix of singles and couples rooms (some with self-contained shower/ensuite/kitchenette) - Shared Laundry with washing machine - Street parking, garaged parking available - Lease Terms: 3 months minimum, 4 weeks bond (RTBA), 2 weeks rent Kindly contact through messaging. Thank you. 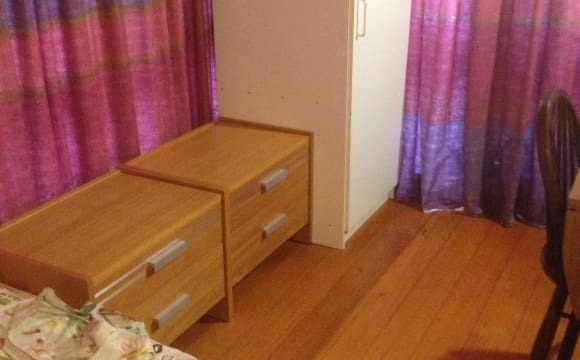 Private and Premier COUPLES furnished Room, QUEEN Bed, Wardrobe, 43" TV with Chromecast, study table, standalone heater, house has ducted heating, FREE Telstra Cable, Super-Fast Mesh Wi-Fi $350 PW, excludes bills ($60PW) Option to include an ensuite shower pod at just extra $30pw! 5-10 minutes' walk from Mitcham Central Train Station, bustling hub of stores, food and amenities - Personal &amp; Private, kitchenette, microwave, hood and pull-out induction stove, fridge - Great dining/communal area, fabulous kitchen with stove, oven and fridge - Strict and clear house rules/expectations to ensure peaceful and harmonious living (non-smokers) - Licensed &amp; Professionally Managed: A mix of singles and couples rooms (some with self-contained shower/ensuite/kitchenette) - Shared Laundry with washing machine - Street parking, garaged parking available - Lease Terms: 3 months minimum, 4 weeks bond (RTBA), 2 weeks rent Kindly contact through messaging. Thank you. Quiet surroundings, lots of natural light in the home, good backyard space with veranda. Short distance from hospital, Eastland and local shops. 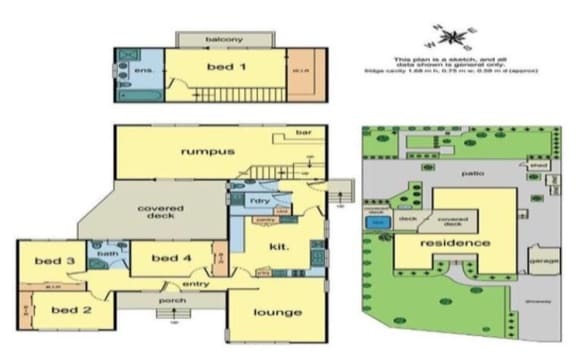 The property has a sectioned off self-contained part of the house, suitable for a fourth person (you) to have their own space. This area which you would have to yourself includes one large bedroom, one bathroom/shower, and one small kitchen/dining area. * All bills (electricity/gas/water/internet) included in price. * Optus Cable Internet is around 45mb/s. There is wifi and an ethernet cable into the bedroom. * The space is currently unfurnished. * We would expect you to officially go on the lease (easily organised). * We would allow you access to our laundry to use our washing machine. * There are plenty of cupboards but no wardrobe (no hanging space). * The kitchen has an old but usable oven. * You would have your own driveway. * You would have your own private entrance - with no access to the main house. * Access to large backyard and washing line. * No pets, no smoking. * The property could be available for longer than 9 months, but it will depend on whether our lease is renewed. 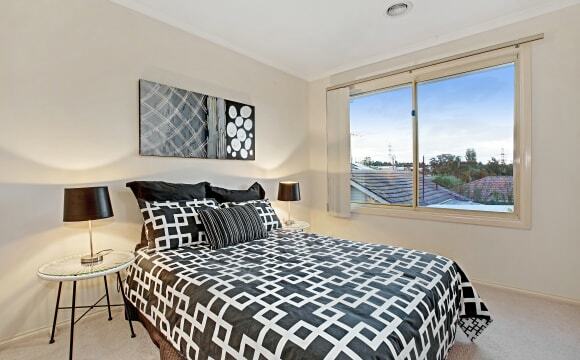 * Close proximity to Mitcham train station, buses, shops and Eastland. •Unlimited wifi. •Bus stop in front •Less than 1km from Mitcham train station •10' walk toColes. •Next to shops, restaurants, laundry •Street parking available •Convenient location Fully furnished modern townhouse with ducted air conditioning- all you need to bring is your bedroom furniture or we can arrange if needed. Close to Woolworths &amp; Coles. The available room is an ensuite with wardrobe and your owned bathroom. The room is available now. I'm looking for someone to occupy on a long term basis, they must be in a full time job, is easy going and keeps a neat/tidy space. Either male or female, No Couples, No Pets, Smoking outside only Medium sized bedroom for rent with built in robes Shared Bathroom, toilet and living area which has a three seater couch and a flat screen TV and Wireless Internet available. I have washing machine and outside clothesline. Approximately 5 minutes walk to Croydon Station and the bus stop is at the entrance of the property. Only 5 minutes walk to all facilities such as shopping centre, gym, medical centre etc. Ducted heating, air conditioning units throughout every room. $185 per week inclusive of bills. We are a young Christian share-house located in a beautiful leafy street in Vermont - close to local shops, walking tracks and public transport. Our household consists of 3 females aged between 25-30 and we are looking for a housemate. The house offers plenty of space with large living/dining areas and comprises of 4 spacious bedrooms (all with built-in cupboards) + a study room. We are looking forward to finding a friendly, respectful and tidy person who will fit in perfectly. Please contact us if you are interested, as we would love to meet with you! Access to warm and cozy great dining/communal areas that includes a fabulous kitchen with stove, oven and fridge. Wifii, Washing machine, Fridge, Bed, Microwave Room, Big backyard, off street parking. One person $250/week, 2 person $280/ week, 3 people $360 per week 6 weeks Bond with Agreement 2 rooms available welcome anytime AVAILABLE!!! PM for more details.